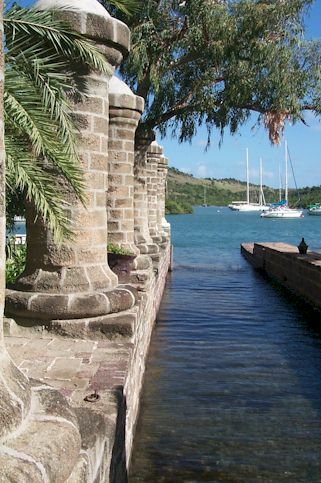 "This is English Harbor Radio bringing you the Marine Weather and news of events in and around English Harbor, Antigua. To all the new arrivals, welcome to you all." Every morning at 09:00 hours the voice of Jol Byerley rings out over the marine VHF radio with the all-important weather report, announcements important to mariners, and local gossip. All presented with good cheer and a distinctly British sense of humor and if he knew it was your birthday you’d get special mention. I remember the morning he reported that there will be strong winds up to thirty knots. "Oh dear… …We’ll have to tie grandmother down." Jol Byerley was one of the ones, along with Desmond Nicholson, who were there at the beginning of the Charter Yacht industry in Antigua and the West Indies. It was then and is now centered around English Harbor at the restored historical site know as Nelson’s Dockyard. Today, throughout the Caribbean, there are quite a few restored historical sites but among the sites I’ve visited, Nelson’s Dockyard is quite unique for being more a site of commercial activity than a museum exhibit. The buildings are beautifully restored and contain, among other things, a sail maker and a rigging shop. 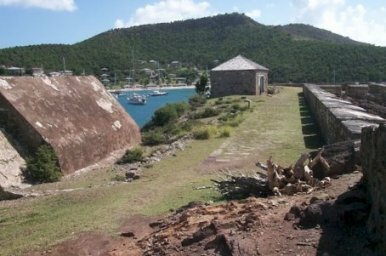 This is fitting to the original purpose, which was to provide a defendable location for the 18th century British Navy to maintain its Caribbean Fleet. It’s called Nelson’s Dockyard because Horatio Nelson, the hero of the battle of Trafalgar, was once the commander of the Caribbean Fleet. It now serves the yachting community with a variety of pleasure boats gracing the docks rather than 18th century warships. This is not by accident. Early attempts to restore the dockyard failed through lack of funding. 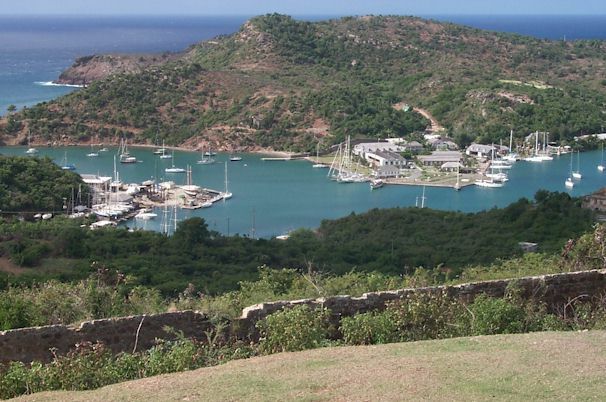 In 1950 the then governor of Antigua noticed a charter yacht alongside the wharf and hit on the idea of turning the dockyard into a yachting center. The charter industry and yachting in general could possibly generate the funds to complete the restoration. Over the years this idea has proven successful and on any day amongst the guided tours being conducted for tourists, yachtsmen are scurrying around negotiating for work to be done while charter guests are being escorted to and from the charter yachts. When I say charter yacht I’m referring to a yacht available for hire with a captain and crew. I’m not referring to bareboat chartering which is without a crew and is today the most popular form of chartering. From its humble beginnings the crewed charter boat industry in Antigua has grown to a world-class operation. All from a bunch of guys who just wanted to have some fun in the tropics. Desmond Nicholson is known worldwide for "Nicholson Yacht Charters," one of the more prestigious charter agencies. During our stay in Antigua the annual Charter Boat Show got underway featuring gold-plated charter yachts from around the world. It’s an insider’s show so only charter brokers and agents were invited aboard. It’s understandable. Both the boats and the agents are there to conduct business so having tire-kickers on board such as myself would only be in the way. But that did not stop a number of us from the cruising yachts wandering the docks and admiring the yachts from the outside. What most impressed me were the incredibly high standards of maintenance imposed on the yachts by their professional crews. Not a scratch, smudge, or fingerprint is allowed to spoil the image of perfection. The Charter Boat Show is only one of a number of annual events hosted at English Harbor. Most, however, are open to all and are held primarily for the sheer fun of doing it. There is the Antigua Classic Yacht Regatta where springy sheers, carved trail boards, and acres of varnish once again hold preeminence. 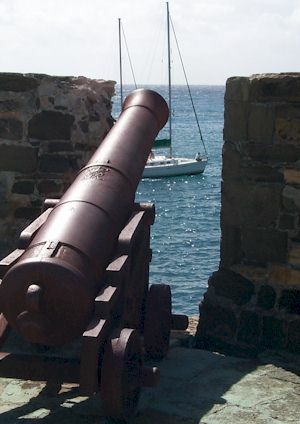 The most famous yearly event, however, is Antigua Sailing Week. Held every spring it’s a full week of hard-core yacht racing and even harder-core partying. It officially began in 1968 but has evolved from a more informal event that dates back to around 1962. In the latest Antigua Marine Guide Jol Byerley writes about the early years. "Most evenings, we would gather on the balcony of the Officers Quarters for rum and ginger and a sing song. We were all practically penniless, but a very contented group of yachtsmen. Then one evening, after a couple of drinks everybody decided that perhaps ‘a yacht race’ would liven things up a little. Had to see if our boats were really ready to go off sailing the following season (or something like that). So the following weekend about ten yachts (none of which were post World War II) could be seen letting go dock lines and coaxing windlasses to grind in the chains. The older skippers watched the proceedings from the Officers Quarters balcony, with Ian Spencer and Mike Broad (two very senior sailors) who left rum drinking to the youngsters, stirring their G & T’s clockwise with the second finger of their left hand. ‘Probably never see ‘em again.’ Would say one. ‘Absolutely’ would say the other. ‘Pity about Jol’s wife though. Pretty little thing eh’ and their eyes would glaze over and they would both nod off in the afternoon shade. Meanwhile, the young bloods in their old gaffers which were all wonderful hunks of teak and oak went off to go racing." Antigua is a truly wonderful island. What is particularly nice is that, while it is now a bustling place with the growth of Caribbean yachting, the old-timers are still kicking around to provide a link with the past. Jol Byerley, along with his wife, now manages "Lord Jim’s Locker" . It’s a wonderful little bookshop located upstairs at the Antigua Yacht Club Marina. Anyone can stop by and meet him. He always seems delighted to have a chat. I was impressed with the photos mounted on the wall of his racing yacht underway with an all-female crew. For that he gets my nod of approval.